Commonwealth Corporation has a history of proven success with health care workforce development strategies. We design initiatives and provide technical assistance to grantees to ensure that programs meet the workforce needs of Massachusetts’ health care providers. In addition to our strategic grant making, we explore innovative solutions to workforce challenges using research and data to support partners in this work. 1199SEIU Training and Upgrading Fund partnered with North Shore Medical Center (NSMC) and Lynn Community Health Center (LCHC), who reported that a growing percentage of their workers were interacting with patients and visitors exhibiting challenging or aggressive behaviors. The partnership used funding from the HCWTF to design and conduct training that would help employees respond to difficult situations. Anna Jaques was experiencing an increase in the severity and illness acuity of their patients. In order to stay competitive, they need to attract and retain nurses with high levels of education who can perform at the top of their license. Anna Jaques partnered with Bay State College and utilized funding from the HCWTF to bring an RN-to-BSN program to the hospital campus. BHN has an increasingly complex patient population: up to 40% of patients presenting for routine or sub-acute care also have mental health and or/substance use problems not being treated elsewhere. BHN leveraged HCWTF funding to train their clinicians for real-time collaborative care delivery and co-located, integrated practices with regional partners. BMC was experiencing a rise in the number of patients with complex health issues. In order to allow RNs to provide advanced care, they needed to enhance the role of CNAs. BMC used HCWTF funds for a comprehensive training program that gave CNAs the skills they needed to complete more complex tasks. They also added a mentorship component where more experienced CNAs mentored and supported novice CNAs. BID-Milton has been hiring nursing students to perform CNA duties in order to provide advanced, quality care to seniors. Upon completing their studies, these students would leave for RN positions. With funds from the HCWTF, BID-Milton developed and delivered an enhanced geriatric CNA and Phlebotomist curriculum to build a better trained multi-lingual, multi-cultural CNA workforce with specialty skills. Many individuals receiving home care depend on complex medical equipment and services, and Centrus was experiencing a shortage of nurses with the required expertise. To increase their skilled nursing pool, reduce the number of missed shifts, and improve capacity to accept new patient referrals, Centrus leveraged HCWTF funding to provide novice nurses with specialized home care/critical care skills training. Many of CSO’s clients with serious mental illness and substance use disorders suffer extremely poor health and have little or no access to primary medical care. In an effort to bridge the care gap and create an integrated, patient-centered, holistic behavior health “home,” CSO out-stationed behavioral health clinicians at primary care offices in the region. 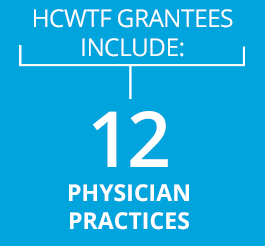 They used HCWTF funds to design and deliver an advanced, CEU-qualified Integrated Health Management Series, enrolled staff in peer leader certificate trainings in wellness, and more. The Medical Assistant workforce comes with varying levels of experience and expertise, and inconsistent education and training. In order to improve the quality and efficiency of care provided to patients, EBNHC utilized HCWTF funds to deliver a comprehensive training program for their Medical Assistants. FHR’s Transitional Age Youth (TAY) patient population struggles with asthma, weight issues, smoking, and 11% did not have an identified Primary Care Provider. 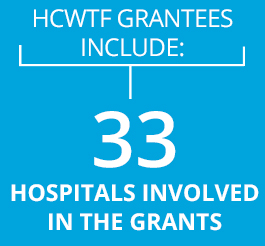 They leveraged HCWTF funds to survey the needs of their TAY patients, hired a Lead Nurse Trainer to train staff in case management essentials, addiction prevention, nutrition/food education, and more. The Gandara Center focuses on promoting the well-being of diverse populations through culturally competent behavioral health, prevention, and education services. 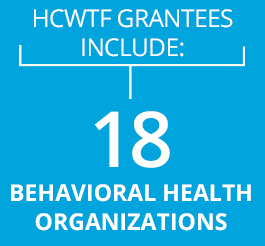 Using HCWTF funds they enhanced the design of and delivered a Children’s Behavioral Health Worker Certificate Program to create a pipeline of new workers with racially and ethnically diverse backgrounds. They provided training for 54 clinical supervisors who oversee in-home family therapy workers, and piloted an integrated, intensive care coordination and behavioral health site within the pediatric practice of a community health center. In three of MSCA’s membership regions, the proportion of residents over 65 is higher than the state’s average, as are readmission rates. They needed to provide coordinated care across multiple settings. Working with nine diverse health care providers across the three regions, MSCA used HCWTF funds to implement a frontline workforce development strategy that gave RNs the foundational knowledge and skills needed to understand their critical role in reducing avoidable hospital readmissions and improving patient-centered care transitions. Southcoast Health’s Medical Assistants had a disparate skill set. Inconsistent workflows, and varying supervisory expectations also led to performance challenges. They utilized HCWTF funding to partner with Bristol Community College to develop a customized curriculum and trained Medical Assistants in crucial skills aligned with Southcoast’s scope of practice, and Patient Centered Medical Home guidelines while preparing workers for national certification. 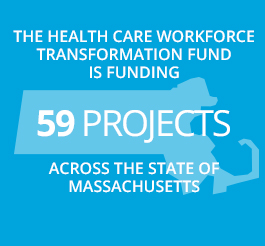 This report provides information about the status of initiatives that have been supported by the Health Care Workforce Transformation Fund (the Fund) as of the end of calendar year 2016. Part One outlines the Fund’s priorities and provides information on the structure for providing Fund oversight and program management. Part Two provides updated information about Training grants. Part Three provides information about a grant to the Massachusetts Technology Collaborative/Massachusetts eHealth Institute (MeHI). Part Four provides information about the status of initiatives managed by the Massachusetts Department of Public Health. Part Five briefly describes the Health Professions Data Series. The Addenda include data, presentations, meeting notes, etc. on fund activity through September 2016. This meeting provided an opportunity for two of our grantees to share their perspectives on the current workforce needs of the Home Care Industry in Massachusetts. The Home Care Aide Council and the Center for Community Health, Education Research and Service (CCHERS) shared an overview of their grant-supported training projects. CCHERS provides a pipeline approach to train and support adults interested in pursuing home care aide jobs. The Home Care Aide Council offers clinical skills and supervisory training to incumbent staff at home care businesses across the state. This meeting provided an opportunity for two of our grantees to share their experiences delivering Motivational Interviewing training to their staffs. Boston Health Care for the Homeless and New England Quality Care Alliance provided an overview of this important communication strategy and shared detailed information on how each of their organizations is utilizing motivational interviewing to help improve patient engagement and quality of care. This meeting continued the conversation on measuring business impact – Commonwealth Corporation’s approach and how we are monitoring outcomes and collecting data from grantees. In addition, one of the Training Grantees (Beth Israel Hospital, Milton) gave an overview of their project, which focuses on giving incumbent CNAs advanced skills in geriatrics and coordinated care. Their project also includes the corporation of geriatric training for CNA students through their local Vocational-Technical school. A compilation of all the advisory board meeting materials from 2015. This includes several presentations: one from the MA e-Health Institute, one from Care Dimensions with an overview of their project the importance of identifying and measuring business impact, an overview of Accountable Care and the needs, strategies and trends in Behavioral Health Integration from the Health Policy Commission, and Behavioral Health Network gave an overview of their project focused on integration of care. Created by the Regional Employment Board of Hampden County. Created by the Home Care Aide Council. A compilation of all the advisory board meeting materials from 2014. This includes presentations from four Planning grantees (VNA Care Network Foundation, Brockton Hospital/Signature Health, Community Healthlink, and 1199SEIU) on their grant activities and outcomes as well as two presentations from Department of Public Health: one on the roles of Community Health Workers and the efforts towards certification, and another on the Health Professions Data Series. A compilation of all the advisory board meeting materials from 2013. Includes presentations from the Health Policy Commission, Department of Public Health, and the MA e-Health Institute funding and grant activities.